The Alpine X-W10D4 10″ subwoofer handles up to 900 watts RMS, so don’t hesitate to give it plenty of juice. This rugged sub features a pulp/mica cone with a parabolic shape that maintains its rigidity and strength for outstanding response and accuracy. 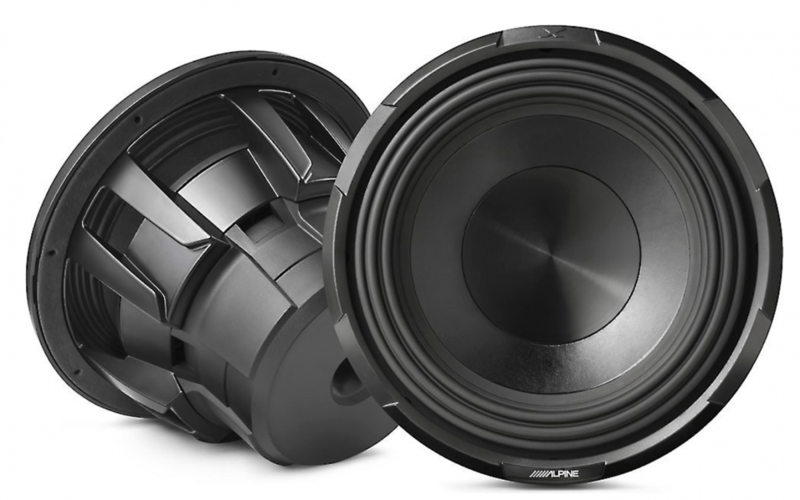 The big rubber surround supports the cone in the sub’s cast aluminum frame, while Alpine’s latest technology allows this sub to move an amazing amount of air (28mm Xmax, for you bass geeks out there) at very high levels while staying cool. You can wire the dual 4-ohm voice coils to get the optimum performance from your amp, or to configure a custom setup with multiple subwoofers. The Alpine X-W10D4 works well in sealed and ported enclosures so you can choose what kind of bass you want to hear and feel. The Alpine X-W10D4 subwoofers take a great platform to the next level. Although the R-Series subwoofers are new for 2017, they actually come from an impressive Alpine lineage – the Type-R subwoofers. The Alpine X-W10D4 subwoofers are rated at 750W RMS. These subwoofers are a perfect match for the PDR-M65 Mono Power Density Amplifier, to create a system that works efficiently together.